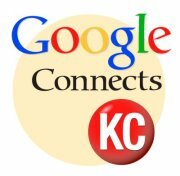 Three Kansas City organizations have teamed up with contributors from KCPT, KCSourceLink, Think Big Partners and others to develop a new, Google fiber-related website, GoogleConnectsKC.com. The Kauffman Foundation, the Social Media Club of Kansas City (SMCKC) and the Mayors’ Bistate Innovations Team (MBIT) have combined forces to help Kansas City residents stay current on the happenings of Google Fiber and its impact on the city’s future through the development of a new, collaborative website, GoogleConnectsKC.com. In the spring of 2011, Google selected both Kansas City, Kansas and Kansas City, Missouri for its first ultra-high-speed, fiber-to-the-home network with Internet speeds of up to one-gigabit per second. In order to foster the collaboration of major Kansas City organizations, Kauffman, SMCKC and MBIT came together to help build out the GoogleConnectsKC.com site and to promote Kansas City as the most entrepreneurial in the nation. The website, with contributors from various organizations including Kansas University Medical Center, the Mid-America Regional Council, KCSourceLink, Think Big Partners, KCPT and many others, has been established in order to provide Kansas City residents with Google fiber-related information, updates and events. The new GoogleConnectsKC.com site also displays an Ideas and Innovation tab that allows citizens to contribute thoughts on how to best utilize Google fiber to positively impact the Kansas City region. GoogleConnectsKC.com encourages users to “get involved, get informed and give ‘gig’ ideas”. To visit the new site, visit http://www.googleconnectskc.com. The Kauffman Foundation's Company Creation Team is one of a number of groups around the metropolitan area meeting to discuss ways we can take advantage of the fiber network. The Team has a goal to encourage startup companies to build applications and services which will take advantage of the network. The Social Media Club of Kansas City is helping citizens on both sides of the state line leverage Google Fiber to benefit their communities. The Give Us a Gig! Project, sponsored by the Social Media Club of KC, will continue discussions that began in 2011 at the Library during the "GigabitCity" events in October and November. At those events, local business and technology leaders gathered in the Central Library to brainstorm and examine ways in which Google Fiber's one-gigabit connection could be used to improve the quality of life for all citizens of the city. The Mayors’ Bistate Innovations Team consists of people appointed by the mayors of Kansas City, Kansas, and Kansas City, Missouri to capitalize on Google’s plans to build ultra-high speed Internet connections in the metro area. Our mission is to help maximize the positive impact of the Google Fiber network throughout the Kansas City metro area. The Mayors’ Bistate Innovation Team has two primary objectives. Short-term, the focus is on how KCK and KCMO residents can benefit from ultra-high speed Internet connections to the home. Bringing digital services to underserved markets is a key part of this phase. Long-term, the focus is spurring innovation and ingenuity to strengthen the region’s economic base, creating companies and jobs.